Preprint back. Your logo is printed on blank panel area. The Big Grocery Vintage Matte Laminated Non-Woven Tote has, well not the most buzz-worthy name. However, what it does have is a big pop of color for a preprinted grocery tote. This is a great bag for farmer’s markets, community gardens, cooking programs. The bag comes with all that beautiful color in the preprint design, on a natural color back drop. We simply add your logo onto the front pocket area. 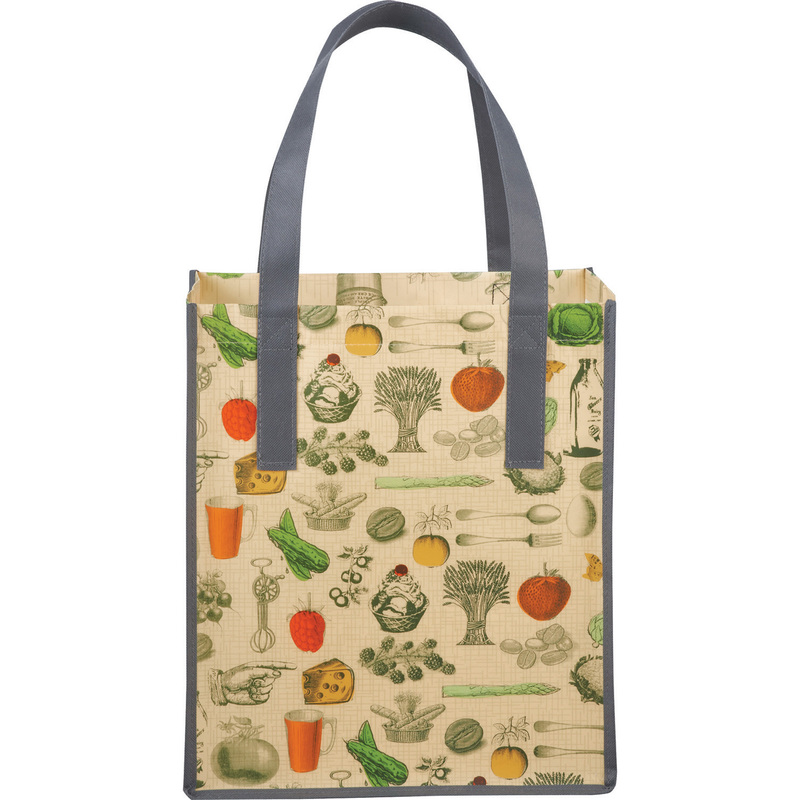 The Big Grocery Vintage Matte Laminated Non-Woven Tote is a big 15″ H X 10″ W X 13″ D, and made from 110g Laminated Non-Woven Polypropylene, a recyclable material. If you are running a program in a city with a bag ban, these bags are great giveaways. They can be cleaned with soap and water, and reused over and over again, constantly showing off your brand. If you are interested in the Big Grocery Vintage Matte Laminated Non-Woven Tote to promote your business, or to get a sample, email info@proformagreen.com for information and pricing. The Laminated Non-Woven Brown Baggin’ It Lunch Bag from LEEDs is another fun concept bag made from non-woven poly, so we are talking about recycled water bottles, yogurt containers, that sort of thing. Now don’t start thinking this is a material that the factory is making, it is not. It is material they are buying, LEEDs just happens to use it to make these cute little bags, other manufacturers use it for other things. For marketing purposes, the Laminated Non-Woven Brown Baggin’ It Lunch Bag is a great lunch bag, with that nostalgic look of the old paper bag, but all the modern comforts, and details. We like these bags for schools and colleges, but also for corporate team building events, and wellness programs. Also they are great give-aways for food, beverage, and catering companies. The Laminated Non-Woven Brown Baggin’ It Lunch Bag is CPSIA complaint (actually a long list of items from LEEDs are CPSIA complaint), so again, good for kids and school programs. The bag comes as shown with a lot of pre-printed artwork. The imprint art for your additional custom artwork is centered on front pocket at 4.00″ H x 4.00″ W. The overall size of the bag is 11″ H X 5″ W X 7.5″ L.
If you are interested in the Laminated Non-Woven Brown Baggin’ It Lunch Bag to promote own business, or to get a sample, email info@proformagreen.com for information and pricing. The Vita Laminated Recycled Shopper gets a new look for 2017, with a variety of pre-printed designs ready to be printed with you company logo. 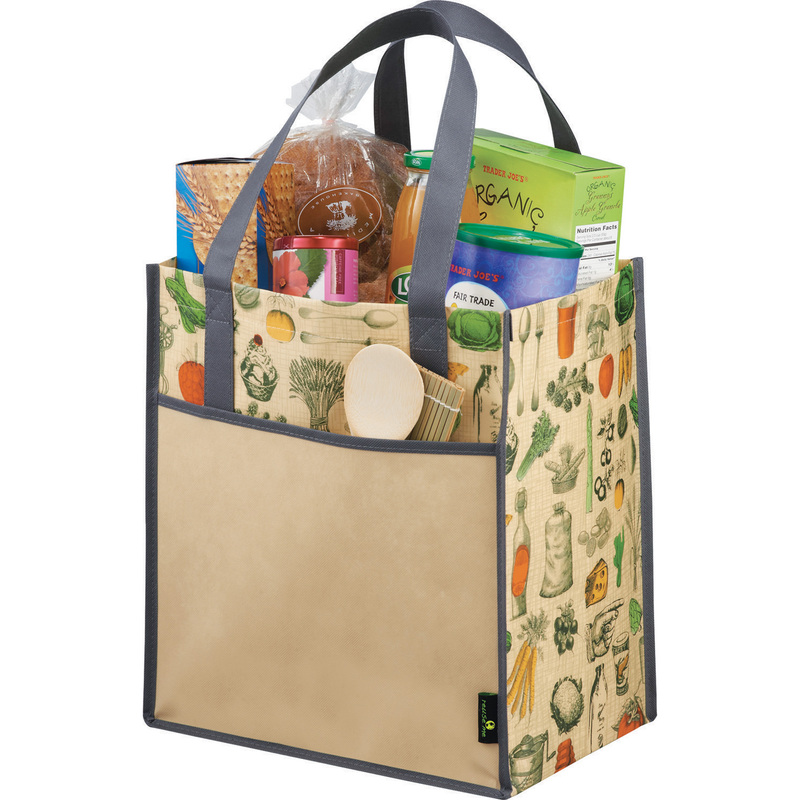 These laminated – and hand washable – non-woven totes are a workhorse basic grocery style shopper, made from 100% recycled PET Fabric. 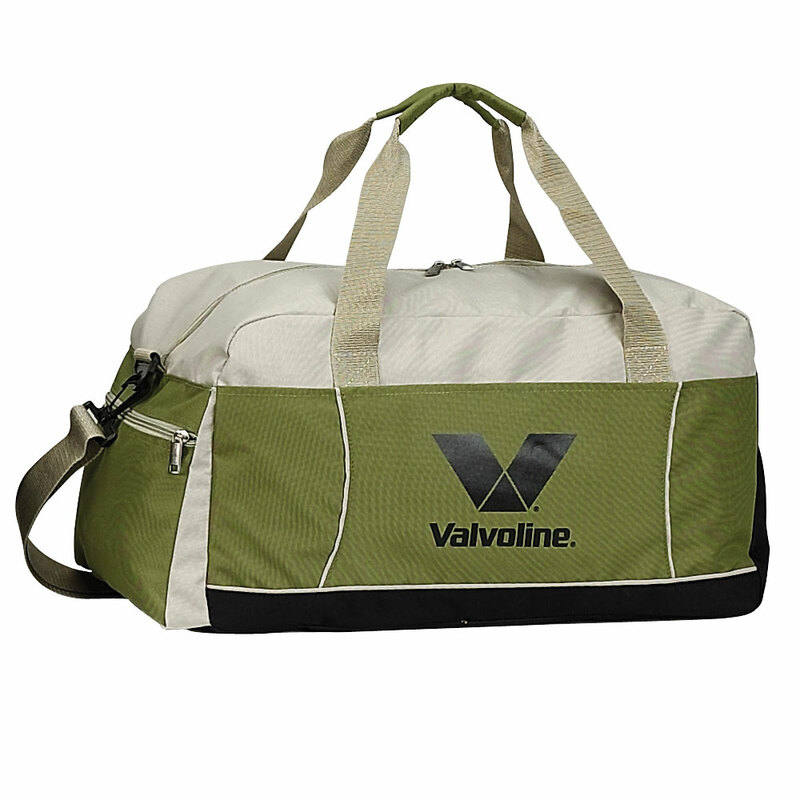 The Vita Laminated Recycled Shopper size is 13″L 15″H 8.5″W, with the new color patterns being based on a theme of Royal Blue, Kelly Green, and Tan. Take a look at the video from Gemline. Let us know what you think. If you are interested in the Vita Laminated Recycled Shopper to promote own business, or to get a sample, email info@proformagreen.com for information and pricing. The Vita Laminated Recycled Shopper from Gemline are still one of the most popular recycled bags on the market. Since we last mentioned Laminated Recycled Shopper bags in 2010, Gemline has continued to add pre-printed designs to this line, and with the Fall 2015 additions, there are now eight unique designs to choose from. The popularity of this new Vita Laminated Recycled Shopper bags rests in the pre-printed art and messaging, with statements like “I used to be a water bottle” and “100% recycled” worked into the design. Each bag is indeed made from a laminated 100% Recycled PET fabric, estimated to keep about the equivalent of three water bottles worth of plastic out of the landfill. 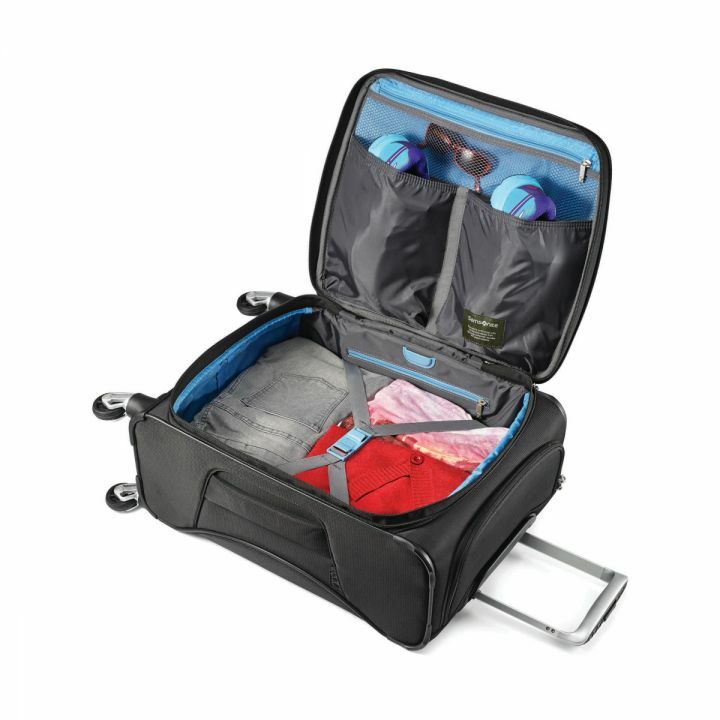 All bags are the same size with a 13″L 15″H 8″W main compartment and generous gusset for maximum capacity. They all feature 23.5″ shoulder straps and are kid-friendly/CPSIA compliant. The following video from Gemline gives you an idea of how big and bold these bags really are, and what can be achieved by simply adding client artwork to the pre-existing motifs. Due to the nature of any recycled material, Alchemy bags, which are constructed of recycled bike tire inner tubes often show the wear and unique markings associated with them. The pictures represented may not be exactly identical to the products you receive. Alchemy is now making a line of high style totes from recycled tires, actually bike tires to be exact. So if your business has anything to do with bike racing, bike manufacturing, bike events, or sales, your promotional items might just have arrived. Take for example the Pike Messenger Bag. We recently ran a sample of this bag for the City of Arlington, Texas, Parks and Recreation department (which shows that your core business need not be bike related for these bags to still work for your brand). Each bag in the line really is just telling a story about what can be done with recycled materials. Completing that loop of the recycled story, there was trash, now there is a bag in its place. Alchemy says each Pike Messenger Bag is made from 67% of their “Upcycled Material”. The eco-friendly bag is a medium sized messenger with a inner divider (15” laptop capable), waterproof exterior pocket, two internal pockets (plus pen slots), and internal key clip. Constructed of upcycled inner tubes, the bags also boast reflective tape for nighttime visibility, adjustable shoulder strap made from upcycled seatbelt, and full front flap with Velcro® closure for extra security. Even the zipper pulls are recycled from the air valves of the bike inner tube. They are a great size at 9″H x 14-1/2″w x 4-1/2″. Decoration is done via embrodiery of a PVC patch direct to the front cover of the flap. All bags bear the Alchemy brand AG logo, and come with a hagtag that tells the story of their creation. All and all, very cool, very hip.